The 10 Best Places for a Kid’s Birthday Party in Louisiana! Half the fun of having a child’s birthday party is in the planning. It’s where the excitement begins, and if you involve your child, it’s even more fun. Add something your child adores and you’ve created more than just a one-day event—you’ve created lasting memories. 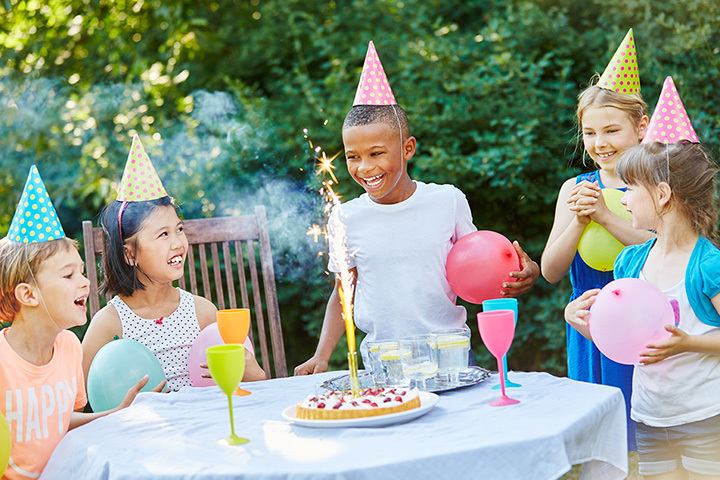 There are so many things to do and places to go, it can be overwhelming, so we’ve compiled a list of the 10 best places for a birthday party to make things little easier. If you want to have your child’s birthday in the comfort of your own home but are looking for something to kick it up a notch, then Party Zone is the place for you. Located in Metairie, Louisiana, Party Zone has inflatable rentals that can be brought right to your location, and include water slides, a bounce house, and other options that will help your event be memorable. You can choose from multiple options and different themes perfect for any birthday party or celebration. Party Zone also has tables/chairs, tents, outdoor fans and other party-related items for rent. Everything you need is in one place. They offer many discounts for fire, police, and military, and the best part is that delivery and set-up is included in the price. Want a different kind of birthday party? Then have it at Culinary Kids in Mandeville, Louisiana. Parties here are typically about 1.5 hours, led by an experienced instructor, filled with recipes, activities, and party food that the kids make themselves. There are different options and add-ons, and kids get to decorate their own chef hats with the birthday guest of honor getting an apron, too. One thing is for certain—everyone at the party is going to have a finger-licking good time. Every girl’s dream is to be a princess, a movie star, or a rock star. At Club Tabby/Tabby Town in Lake Charles, Louisiana, those dreams can actually come true for a day. Choose from six different packages and fun add-ons like mini-pedis, t-shirts, and a visit by a princess! Pamper the birthday girl with the best star treatment starting with limo rides to complete make overs and then dance it up on the dance floor or model on the catwalk. Family-owned Artistico Express is the perfect place to hold an artistic child’s party. Parties are designed for ages five and up, but there’s fun for the whole family at this Baton Rouge, Louisiana pottery and clay studio. Each guest of the birthday girl or boy will get to choose a piece of pottery from the birthday shelf and six different colors they want to use. Then they will get to design the piece they chose any way they want as a take home souvenir. What a great memento to remember such a fun birthday party! Pinkolicious Birthday Party Spa in Baton Rouge, Louisiana, is perfect for little girls who are celebrating a birthday. This is the ultimate pink spa, catering to your little princess and her friends. Attendees will enjoy two hours of relaxation and pampering including mani/pedi treatments, facials, and make up in an atmosphere that’s created especially for them. Parties can be booked any day of the week except Sunday, and there are week day specials. Check the website or Facebook page for details. Clayfish Bisque Inc. located in Lafayette, Louisiana, is a great place to host your next birthday party. This walk-in pottery shop has been providing fun alternatives to home-based parties since 1998. Open every day for general pottery fun, private parties can be booked on weekends and you’ll have the entire studio to yourself. The friendly staff who will assist with your party love to help children understand the process behind creating clay items. Best of all, the whole birthday group will get to create a beautiful item to take home. It’s Paint Party is not your average painting place. Located in Carencro, Louisiana, this unique party venue is the one and only glow-in-the-dark painting place in the area. They provide a safe environment for all ages to come and get creative. They provide the cake and drinks. Kids will get to help paint their own step-by-step item that they will have to take home and to remember the exciting time they had. Paint Party is where art and fun meet. Any animal-loving children in the house? If you’re that child’s parent and you’re trying to think of a creative way to celebrate their next birthday, you want to take a look at Wildwood Farm. Located in Hammond, Louisiana, this is not your average birthday party location. The farm provides pony rides and has a miniature petting zoo for your child’s enjoyment during the week, but they have something no other farm has—a unicorn! And when you plan to have a birthday party here, your party includes Willow, the Unicorn for children to ride! Also included are the animals in petting zoo, like the tiny donkey, Clover, the giant rabbit, goats, and more. For all those who say unicorns don’t exist, better plan a trip to Wildwood Farms. If you want to celebrate the next birthday party in a magical place where stories come to life, check out New Orleans City Park. Like no other park in the area, this public park has a Carousel Gardens, where children can ride the carousel, train, play with slime buckets, and enter the Construction Zone. Storyland is the place where the party begins, and City Putt is an 18-hole mini golf course just waiting for young golfers. Before you leave, you have to visit the Train Garden with more than 1,300 feet of trains and street cars. There is so much to do, no one will forget this enchanted birthday. Children museums are great places because the exhibits are meant to be hands on. What better place to have a birthday party then a place where kids can explore and play? At Northeast Louisiana Children’s Museum in Monroe, Louisiana, there are different exhibits where kids can dive in and get to know the inner workings of all kinds of things. The Kids’ Café, Discovery Hospital, The Big Mouth, and The Resuseum are all places to explore. The Baby Bayou is specifically designed for those three and under, so they can enjoy their time, too.